The Dow Jones today is climbing as U.S. Federal Reserve Chair Jerome Powell downplayed worries about market volatility and indicated the Fed would maintain gradual interest rate increases. Dow futures are down 53 points after a choppy morning of trading ahead of the 8:30 a.m. release of testimony to Congress. Market turbulence has investors on edge, but you don't have to go it alone. Click here to sign up for Stock Market Crash Insurance alerts and get live updates on how to make money in even the worst conditions. 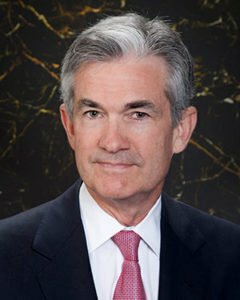 Today, Federal Reserve Chair Jerome Powell will testify for the first time as the leader of the central bank in Washington today. Powell will speak before Congress on the pace of future interest rates and the state of the U.S. economy. Powell assumed the role as Fed chair recently after replacing Janet Yellen, who served one term at the helm. Gold prices pushed back above $1,335 this morning as investors prepare for Fed Chair Powell's statement this morning. Gold investors are especially interested in Powell's views on the strength of the U.S. dollar after it recently hit a three-year low on Feb. 16. Also pushing gold prices higher are reports out of Papa New Guinea. In the Pacific Island nation, miners are reporting infrastructure damage to their development projects after a 7.5 magnitude earthquake happened over the weekend. Martin Shkreli could be heading to prison for more than a decade. The so-called "Pharma Bro" will be sentenced on federal fraud charges on March 9. Ahead of the sentencing, a federal judge said that his securities fraud caused at least $10.4 million in losses for investors. As a result, federal guidelines could push his prison term to at least 10 years. His lawyers had been pushing for 16 months in prison at most, or as little as time served. Crude oil prices pushed to three-week highs as traders continue to monitor OPEC's plans to cap excessive production through the balance of 2018. In addition, traders are growing more optimistic that demand will rise ahead of U.S. driving season. The WTI crude oil price today and the Brent crude price were both flat this morning. The price of Litecoin retreated more than 4% over the last 24 hours. The downturn came after the launch of LitePay, a payment processing platform that will be available to merchants in 41 nations. LitePay is considered an alternative to BitPay, which is the largest Bitcoin payment processor for merchants in the world. Here's more on the launch of LitePay and what it means to cryptocurrency prices. Shares of FitBit Inc. (NYSE: FIT) plunged more than 11% in pre-market hours after the smart-technology company fell short of Wall Street earnings expectations on Monday. The firm reported an earnings per share (EPS) loss of $0.02 per share on top of a weak revenue figure that fell short of expectations by $18 million. In addition, the firm released a really weak quarterly outlook and said that its revenue will fall by as much as 20% year over year. Shares of Macy's Inc. (NYSE: M) are in focus as the retail giant prepares to report quarterly earnings before the bell Tuesday. Wall Street anticipates that the company will report EPS of $2.69 on top of $8.70 billion in revenue. Markets will be looking for updates on whether the retail giant experienced strong holiday sales and was able to maintain any sales momentum heading into the New Year. Apple Inc. (Nasdaq: AAPL) stock is on the verge of a new all-time high. The stock's recent uptick comes after Warren Buffett announced Monday that his firm, Berkshire Hathaway Inc. (NYSE: BRK.A), increased its stake in the technology giant. In other news, Apple is reportedly developing a brand-new iPhone that will be its largest ever of such a device. Bloomberg reported that the company is aiming to create a larger phone display than its rival Samsung's flagship S series phones. Look for additional earnings reports from Booking Holdings (Nasdaq: PCLN), Workday Inc. (Nasdaq: WDAY), Square Inc. (NYSE: SQ), Papa John's International Inc. (Nasdaq: PZZA), AutoZone Inc. (NYSE: AZO), Toll Brothers Inc. (NYSE: TOL), Hertz Global Holdings Inc. (NYSE: HTZ), and Albermarle Corp. (NYSE: ALB).